Take charge of your electronics with these tried-and-tested surge protectors. If you’ve ever spotted flickering lights, tripped circuits, or prolonged overheating of certain electronics in your home, you may have experienced a power surge. This is a sudden and brief jump in voltage (lasting as few as three nanoseconds) above the standard 120 volts that runs through your home. It might be caused by switching on high-voltage electronics, improper wiring, an overtaxed power grid, or even wind or rain—any of which can lead to equipment failure or electrical fires. Luckily, a set of surge protectors can save the day in your home office, entertainment center, or wherever else your big-ticket electronics live. Resembling power strips, these devices plug into a grounded wall outlet (a three-prong outlet) and offer a number of spots to plug in. But unlike power strips, which don’t protect electronics from voltage spikes, surge protectors divert voltage above a certain threshold to the ground wire. Should you experience a surge, these devices stave off damage to your computers, printers, gaming systems, and other appliances. 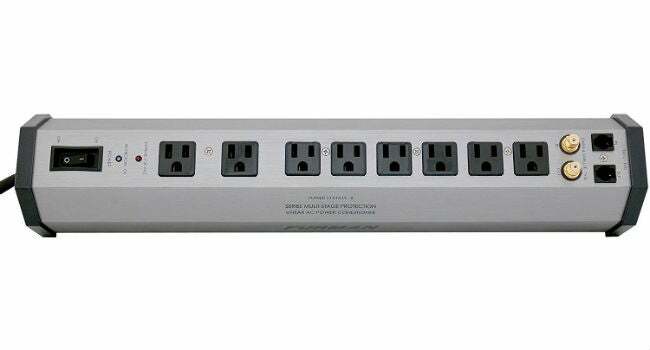 The best surge protector is one that works as advertised during a real power surge. To narrow your options, read on for ideal specs to look for in a surge protector and our picks for the best surge protectors on the market. Look for this key criteria when shopping for surge protectors at the hardware store. • UL rating: Look for both the UL mark (a symbol consisting of a circle inscribed with “UL”) and the specific rating of “UL 1449 Listed” or, even better, “UL 1449 4th Edition.” These marks indicate that the surge protector has undergone rigorous safety and performance testing by the Underwriters Laboratory and meets the minimum performance rating for surge protectors. Surge protectors without this mark or with only the label “UL” or “UL tested” offer insufficient surge protection capabilities. • Clamping voltage: This term refers to the voltage level at which the surge protector begins to attenuate the surge—the lower the better. The best surge protectors feature a clamping voltage of no more than 400 volts. • Joule rating: This rating indicates the amount of energy that the surge protector can absorb before failing. Look for a Joule rating of at least 360 Joules. For expensive or sensitive electronics, such as computers, recording equipment, or hard drives, raise your standards and search for a Joule rating of at least 1,000 Joules. • Cost: Surge protectors range in price from $5 to $150, but high-quality devices that meet the above criteria will usually run you at least $10. Protectors on the higher end of this range are worthwhile for protecting expensive electronics that would otherwise be costly to replace if damaged by a power surge. • Status indicators: At a minimum, look for surge protectors with LED lights that indicate whether or not devices plugged into the surge protector are currently protected. Some products contain additional diagnostics LEDs that help you diagnose power problems. • Energy-saving features: While not a must-have, using surge protectors with energy-saving features such as automatic outlet shut off can reduce your energy consumption and overall energy bills. To help you narrow your options, we’ve identified some of the top-rated surge protectors on the market based on the above criteria, third-party product testing site rankings, and ratings from real customers. Check out five of the best surge protectors today. Named Wirecutter’s best surge protector and rated 4.6-out-of-5-stars on Amazon, this UL 1449-rated surge protector features 10 plug outlets, a clamping voltage of 150 volts, and up to 2,395 Joules of surge suppression. If surge protection becomes compromised, a built-in resettable 15-amp circuit breaker automatically shuts off power to the outlets and saves your electronics. The illuminated master switch gives you the ability to turn on and off all connected devices with a single touch, while green and red status LED lights indicate protection status and grounded status, respectively. This Tripp Lite surge protector comes with a lifetime warranty. Available on Amazon. 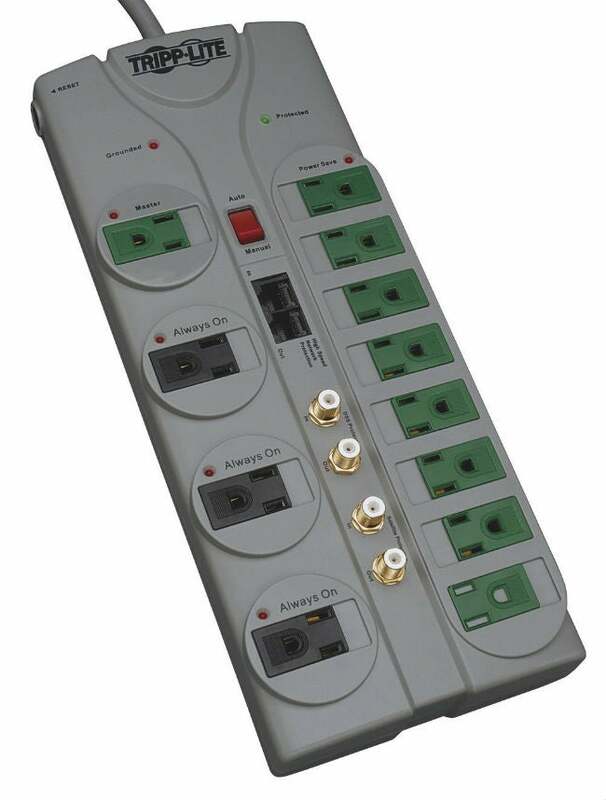 Awarded 4.6 out of 5 stars by Amazon consumers, this UL 1449-rated surge protector with a clamping voltage of 330 volts can absorb up to 4,320 joules of surge yet keeps the power on even after surge protection has been compromised—an advantage if you own many sensitive devices that can be damaged with abrupt shutdowns, such as solid-state storage devices. The ergonomic design fits two clearly identified LED status indicators (“Protected” and “Not Grounded) next to four stationary vertical and eight pivoting right-angle plug outlets so that you can easily accommodate—and monitor—both small and larger adapters. Three bonus RJ11 jacks afford surge protection for telephone and fax equipment to boot. 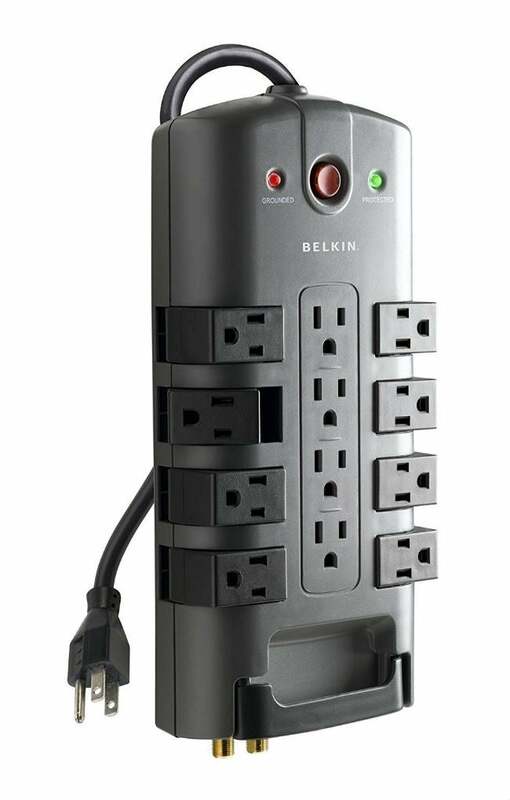 This Belkin surge protector comes with a lifetime warranty. Available on Amazon. Capable of clamping down a 5,000-kilovolt surge down to 43 volts in testing performed by Wirecutter, this UL 1449-rated surge protector wows independent researchers and consumers alike. (Just ask the Amazon reviewers who gave it 4.9 out of 5 stars!) It packs impressive surge protection capability into a sleek aluminum chassis. 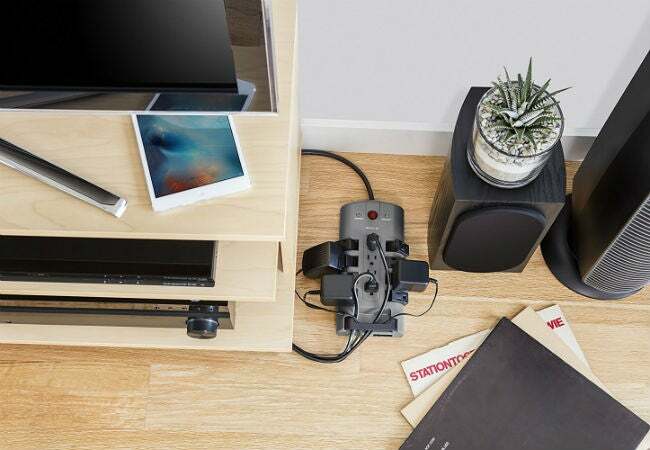 The device’s zero-ground-contamination circuitry allows it to feed filtered AC power to audio rigs, home entertainment systems, and any other top-of-the-line equipment connected to its eight plug outlets and two jacks. Should it receive 137 volts or more of current, the extreme voltage shutdown feature will automatically kick into gear to safeguard your most expensive electronics. Contact the seller for warranty information on this Furman surge protector. Available on Amazon. 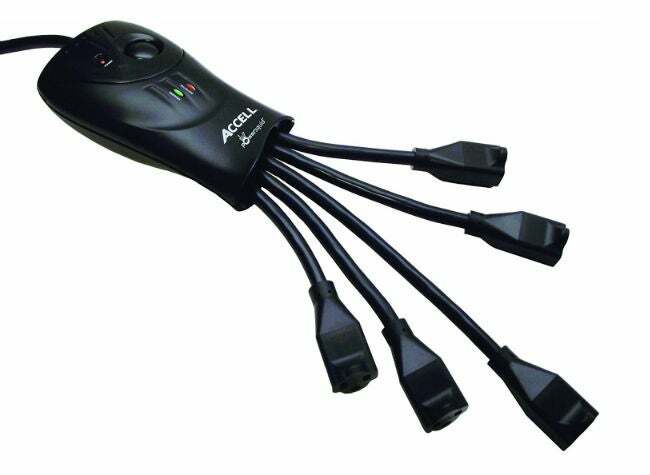 The five squid-like arms of this UL 1449-rated surge protector each feature a sizeable plug socket that effortlessly bends back and forth or side to side in order to receive unwieldy transformers and large adaptors. Their flexible construction also means that they move in the direction of any arms that are accidentally pulled, so that you’re less likely to unintentionally cut power to your electronics by tripping over a cord. Featuring a clamping voltage of 400 volts, the device (which received 4.5 stars from Amazon reviewers) stops conducting power after it reaches a maximum absorption capacity of 1,080 Joules. This Accell surge protector comes with a 5-year warranty. Available on Amazon. Amazon reviewers gave this UL 1449-rated energy-efficient surge protector an impressive 4.2 out of 5 stars for the help it offers in lowering their bills. 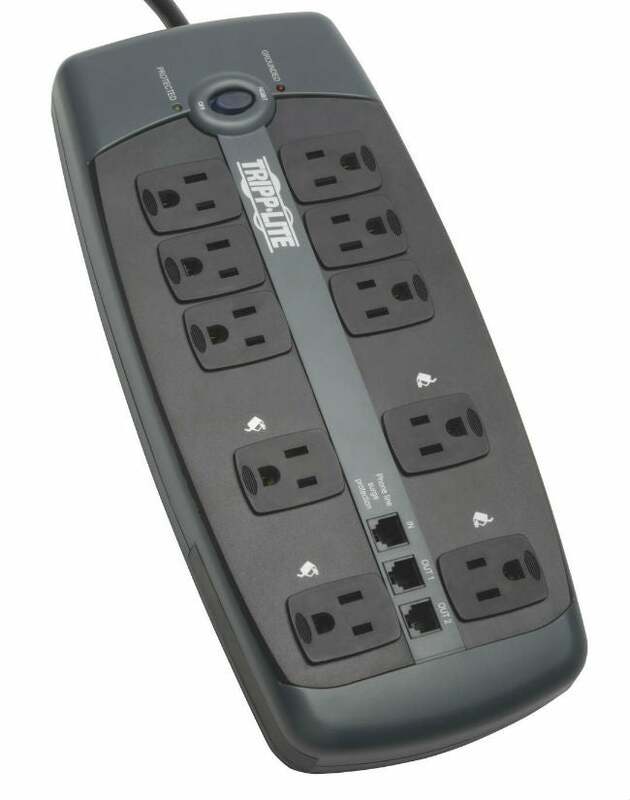 Of the dozen outlets, one is a master outlet, three outlets always stay powered on, and eight are energy-saving outlets that shut off when the device detects that you have powered off the equipment connected to the master outlet. Essentially, they counteract the vampire effect of leaving appliances plugged into outlets all day long. All outlets get an added boost of safety from diagnostic LEDs and integrated child-safe sliding outlets that can effortlessly be slid shut when the outlets are inactive. This Tripp Lite surge protector—with a 3,600-Joule capacity and a clamping voltage of 150 volts—comes with a lifetime limited warranty. Available on Amazon.